For over 18 years, the Law Offices of David I. Pankin, P.C. has been fighting for the consumers of New York City and Long Island. The firm has represented over 10,000 clients with their bankruptcy, predatory lending, foreclosure defense, and other consumer protection matters. 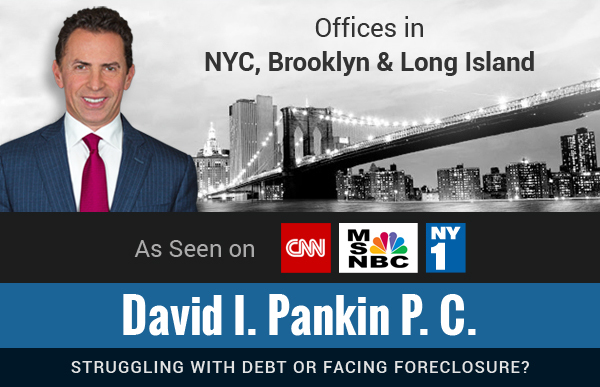 From consumers struggling with credit card payments, to hardworking New Yorkers facing wage garnishment or frozen bank accounts to homeowners behind on their mortgage payments, David Pankin and his legal team have helped their clients obtain the debt relief they need to get a financial fresh start. The bankruptcy laws allow consumers to gain a fresh financial start by eliminating their debt and allowing them to keep their exempt assets. David Pankin and his legal team are dedicated to providing a bankruptcy lawyer who offers effective representation, individual attention and affordable fees for his or her bankruptcy clients. Their initial consultations with a New York bankruptcy lawyer are free and convenient payment plans are always available. The firm is customer-service oriented with a strong reputation for providing personalized attention and dedicated counsel. Each NYC bankruptcy lawyer spends time getting to know each of his or her clients and diligently responding to any questions or concerns they might have. Since the changes to the bankruptcy law back in 2005, many people mistakenly think that bankruptcy may not be an option available to them. They think that there is no way out of debt. This is not the case. Bankruptcy is still an effective alternative for many individuals facing financial difficulties. Whether you live in Manhattan, Brooklyn, Queens, The Bronx, Staten Island, or out on Long Island, David I. Pankin and his staff of lawyers and paralegals will provide you with experienced, cost-effective legal advice and counsel. Please contact our office by phone at 888-529-9600 to arrange for a free, initial consultation with a Manhattan bankruptcy lawyer or a bankruptcy lawyer in any of the surrounding areas.